Getting on the mat every day is a goal for most yoga practitioners I’ve talked to, but for many of them, that’s just not happening. Making time in a busy schedule is one of the biggest challenges I’m seeing people deal with. 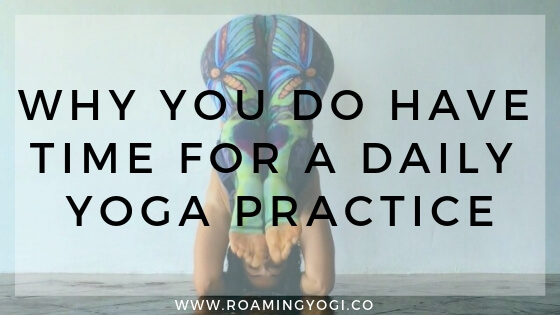 It might feel like there’s just nowhere in your day where you can fit in yoga, but I’m here to tell you why you DO have time for a daily yoga practice. No matter how busy your schedule, here are 5 reasons you do have time for daily yoga! The biggest obstacle you might face in trying to get on your mat every day is thinking that your practice has to be a certain length. I struggled with this in a huge way for a long time…if I didn’t have at least an hour to practice, I resigned myself not practicing at all. I did myself a big disservice by not being open to the idea of a shorter practice. When you go to a studio, classes are typically 60-90 minutes long, and while that kind of time on your mat is ideal, it’s not necessary every day. Your yoga practice can be as short as five minutes – just a few sun salutations and a child’s pose. What matters is that you connect to your breath and focus your awareness. Related to the thinking that my practice had to be a certain length was my need for my practice to be a tough workout. If I wasn’t going to sweat, what was the point? 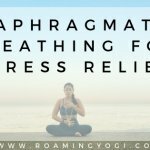 I didn’t realize at the time just how many incredible benefits there are to practicing yoga – physical fitness is just one of them! And again, less intense movement is still better than no movement at all. If you’re finding that you’re passing on a yoga practice because you don’t feel it will be enough of a workout, I encourage you to add other forms of fitness to your physical practices. I love weight lifting, group fitness, and spin classes. Taking part in these other forms of fitness liberate my yoga practice so that my time on my mat is just for me – it’s not necessarily for a workout. For many of us, going to classes at a yoga studio is just not accessible on a daily basis. Whether that’s because it’s financially unfeasible, there’s no studio close enough to home, or there’s no studio schedule that works with your busy schedule. This does not have to be an impediment to a daily yoga practice. YouTube has a plethora of yoga videos of varying lengths available for free – if you’re reading this article using the internet, then you can probably stream a YouTube video and get your practice on. If YouTube is not quite your style, and you do have some money to spend, there are a number of subscription services that you can subscribe to – YogaGlo, Yoga International, and Ekhart Yoga, just to name a few. If you have some familiarity with yoga poses, you can also practice on your own, without the need for a teacher guiding you. My best advice is to step on your mat and see where your body takes you – move in a way that feels good! 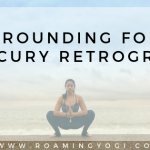 If you like the idea of flowing on your own but you’d like a bit of structure, download the Consistency Worksheets at the bottom of this post – they include a Yoga Sequence Builder! 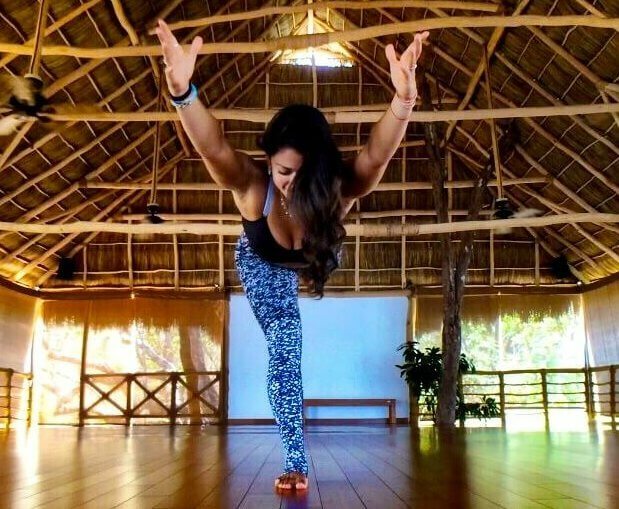 You might have heard that yoga is more than just the physical poses, and that’s 100% true. The pranayama (breathwork) and meditation practices are just as (if not more important) when it comes to a yoga practice. And the beauty of these practices is that you can do them anywhere! 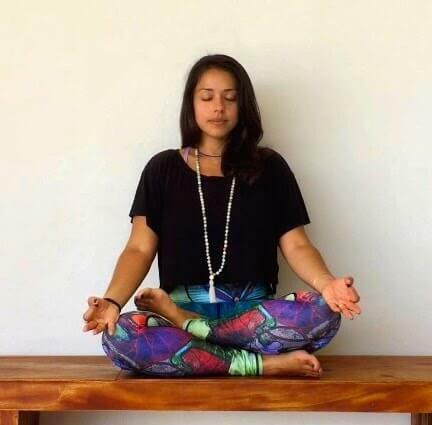 Pranayama is simply a matter of connecting to and regulating your own breath, and any action can be a meditation if done with mindfulness and awareness. You can do your practice while you’re waiting in line at the supermarket, or stuck in traffic! How’s that for making time in your busy schedule? Then there’s also living your yoga. The first two limbs of the yoga practice have nothing to do with poses or breath – they’re all about how you live your life. If you practice non-harming during your day, you’re practicing yoga. If you practice truthfulness, or finding contentment in the present moment, you’re practicing yoga. Opportunities to practice are literally everywhere; you just have to be open to seeing them. Related: What Are the 8 Limbs of Yoga? One of the Nyiamas, or standards of individual conduct (which is one of the eight limbs of yoga), is tapas, or self-discipline. We are meant to be disciplined in our practice. Yes, yoga makes us feel good, and that feeling is why many of us continually return to the mat. But it’s also a practice, and no practice progresses without discipline. So be honest with how often you want to get on your mat, and commit to it. Schedule your practice time into your calendar and stick to those times with the same discipline that you use to show up to all of your other important appointments. Download the Consistency Worksheets below and use the Practice Calendar to help you schedule in your practice time. 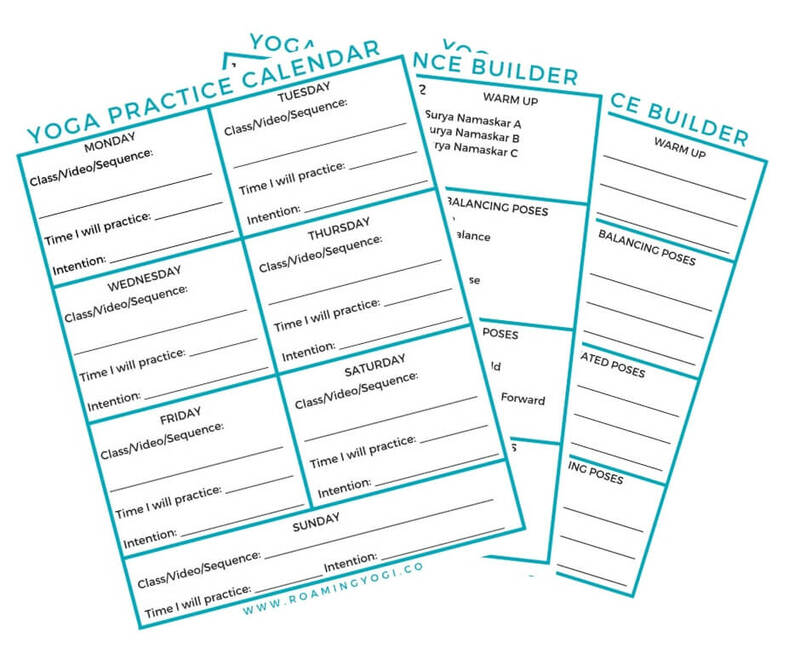 Download the free yoga practice calendar + sequence builder to help you maintain a consistent practice! I want the consistency bundle! Do you have a daily yoga practice? How do you make time for it in your busy schedule? Share with me in the comments! Fill out the form below and I'll send these worksheets straight to your inbox! Yes, I want the free worksheets!